A United Launch Alliance Atlas 5 rocket thundered away from Cape Canaveral Wednesday, boosting an unpiloted military spaceplane into orbit for a secret mission. Hitching a ride on the Atlas were 10 small CubeSat spacecraft, including an experimental "LightSail" satellite provided by the Planetary Society to test the feasibility of using sunlight for propulsion. The 206-foot-tall Atlas 5's Russian-built RD-180 first stage engine ignited on time with a rush of fire at 11:05 a.m. EDT (GMT-4), generating some 860,000 pounds of thrust and pushing the towering rocket away from pad 41 at the Cape Canaveral Air Force Station. Mounted inside a protective nosecone fairing was one of the Air Force's two Boeing-built X-37B spaceplanes, a compact delta-wing craft equipped with a payload bay, a solar power boom and sophisticated computer control systems enabling long-duration, autonomous flights. Three previous missions logged a combined 1,367 days in orbit, roughly a month longer than NASA's space shuttles accumulated over 135 missions. The most recent X-37B flight lasted 674 days. But the Air Force provides little advance information and does not reveal mission objectives, orbital parameters or mission duration. In a departure from past practice, the identities of two secondary payloads aboard the current mission were acknowledged: a NASA materials science experiment and an advanced thruster that will be tested in space. And the Air Force agreed to launch the CubeSat spacecraft from a deployment housing attached to the base of the Atlas 5's Centaur second stage. But no details about the X-37B mission were revealed or whether the flight will end with a landing at Vandenberg Air Force Base, Calif., where all three previous flights ended, or at the Kennedy Space Center in Florida, where Boeing has taken over two shuttle processing hangars for the X-37B program. Joan Johnson-Freese, a space policy analyst at the Naval War College, said the spaceplane appears to be what the Air Force says it is, a technology demonstrator and testbed, but she said the secrecy surrounding the program likely will continue fueling concern among potential adversaries. "What's interesting to me is it's being done in such an opaque manner," she said in an interview. "If the Chinese were doing this, oh my God, there would be congressional hearings on a daily basis and programs being ginned up to respond to it. It has capabilities that other countries aren't sure about, and so they're going to be very nervous about them. If it's a highly maneuverable space vehicle, that has some pretty significant implications." In any case, the Atlas 5 put on a spectacular show, majestically climbing away from Cape Canaveral atop a jet of brilliant exhaust, arcing away to the east and quickly disappearing from view over the Atlantic Ocean. Dramatic "rocketcam" shots looking back toward Earth showed Cape Canaveral, the Florida peninsula and the limb of the Earth in the background, even the 3-mile-long shuttle runway at the Kennedy Space Center where the X-37B might eventually land. The RD-180 engine shut down as expected about four-and-a-half minutes after liftoff, the first stage fell away and the hydrogen-fueled RL10C-1 engine powering the Centaur second stage ignited to continue the climb to orbit. In keeping with past practice with mostly classified military missions, United Launch Alliance ended its running commentary of rocket performance, altitude and velocity shortly after stage separation. But the remainder of the ascent apparently went well. 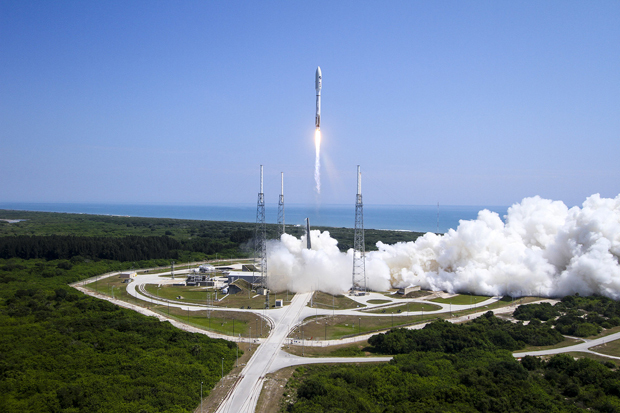 In statements released well after the launching, the Air Force called the flight a success, confirming "the Atlas 5 rocket carried into low Earth orbit an X-37B Orbital Test Vehicle making the fourth space flight for the X-37B program. "As for the CubeSats, all 10 satellites were released from the base of the Centaur second stage about two hours after launch. Measuring roughly 4 inches a side, CubeSats are widely used for low-cost, relatively modest experiments launched by college students, private companies and government agencies. The 10 launched aboard the Atlas were mounted in a housing known as ULTRASat. According to ULA, the National Reconnaissance Office sponsored three Naval Academy CubeSats, three were provided by the California Polytechnic State University, one by Near Space Launch and the Air Force Research Laboratory and two provided by the Aerospace Corp., the Massachusetts Institute of Technology and eSpace. The NRO-sponsored CubeSats were designed to test a variety of technologies, ranging from space-based internet data relay to small-scale propulsion systems and communications. NASA sponsored the LightSail, made up of three CubeSats bolted together. Funded by members of the Planetary Society, a non-profit space advocacy group founded by Carl Sagan and colleagues, the LightSail is the first of two spacecraft designed to test the feasibility of using the pressure of sunlight on large, lightweight sail-like panels to provide propulsion. The goal of the initial mission, which cost the Planetary Society $4.3 million, is to test the mechanism that will deploy four sail-like Mylar panels from the spacecraft, to evaluate control software, communications and power systems. The panels making up the solar sail are not expected to deploy for several weeks, after the cluster of CubeSats launched Wednesday have time to drift well away from each other. The LightSail spacecraft will not be high enough for any significant solar sailing but if all goes well, a second mission in 2016 will do just that. "Today is an extraordinary day for the Planetary Society, our members and space enthusiasts around the world: LightSail successfully launched into orbit," Bill Nye, the "Science Guy" and CEO of the Planetary Society, said in a statement. "While we celebrate this step, LightSail's biggest tests are still ahead. Over the next days, we will be monitoring our CubeSat as we prepare for the big show: the day LightSail deploys its super shiny Mylar sails for flight on sunlight. Stay tuned; the best is about to happen." Nye told reporters Tuesday that solar sails offer a low-cost way to move instruments and other payloads across the inner solar system. While such flights would take longer -- a month to reach the moon instead of a few days with a traditional rocket system -- solar sails would be much less expensive. "You can trade money for time," Nye said. "If you have time, you can send a solar sail to the moon, to Mars, to an asteroid. The other really practical application of solar sails is to get in an orbit between Venus and the Earth and keep station with the Earth. "The two things that I envision are keeping track of solar weather. When there's a coronal mass ejection on the sun, you would know about it a few hours earlier. And the other thing is looking for asteroids. If you had a spacecraft there between the orbit of Venus and the orbit of Earth, you could look for Earth-crossing asteroids. That would be of great practical value. You would absolutely be able to find them. So it's cool!" The Planetary Society first attempted a light sail mission in 2005, but the Russian rocket used to launch the spacecraft failed. NASA launched a CubeSat-class solar sail in 2010 to test re-entry systems for small satellites.